Recently, EUS-guided biliary drainage (EUS-BD) has been developed as a novel advanced drainage technique when ERCP has failed in such cases.,,,,,,, In these EUS-BD techniques, EUS-guided hepaticoenterostomy (EUS-HES), including hepaticogastrostomy or hepaticojejunostomy using a metal stent (MS), has been commonly compared with EUS-guided antegrade stenting (EUS-AS) because of its short procedure time and simple guidewire manipulation across the stricture and papilla. However, bile flow in EUS-HES is not physiological, resulting in short stent patency, in particular, when using nondedicated stents. Thus, we hypothesized that EUS-AS may be an ideal stent placement technique as well as traditional stent placement using ERCP. On the other hand, EUS-AS alone may cause serious bile leak from the puncture site if acute stent dysfunction occurs due to inappropriate stent placement or insufficient stent expansion. Furthermore, re-EUS-BD is required in cases of early or late antegrade stent dysfunction even after full stent expansion. Recently, a novel EUS-BD technique consisting of EUS-HES and EUS-AS using MSs has been reported to decrease adverse events, provide longer stent patency, and simplify re-intervention in patients with distal MBO., Furthermore, we have reported the usefulness of a dedicated plastic stent (PS) for HES stents. Here, we evaluate the short- and long-term outcomes of the novel EUS-BD technique, employing EUS-AS using MS plus HES using a dedicated PS for distal MBO [Figure 1]. A total of 23 patients (14 men, median age: 69.0 ± 12.2 years, range: 41–91 years) who underwent EUS-AS and EUS-guided HES (EUS-AS+HES) for MBO, excluding hilar bile duct obstruction, from October 2014 to July 2017 at Tokyo Medical University Hospital were retrospectively reviewed. Patients were given antibiotics before the procedure, and the procedure was performed under sedation with flunitrazepam and pentazocine. All procedures were carried out using a linear array echoendoscope (GF-UCT260; Olympus Medical Systems, Tokyo, Japan) connected to an ultrasound processor (EU-ME2; Olympus Medical Systems, Tokyo, Japan). First, the accessibility of the intrahepatic bile duct (IHBD) in the left lobe of the liver was carefully scanned from the stomach, and the presence or absence of intervening blood vessels along the puncture route was confirmed using color Doppler imaging. Next, the dilated IHBD was punctured under EUS guidance with a 19G fine-needle aspiration (SonoTip Pro Control; Medi-Globe GmbH, Achenmühle, Germany) [Figure 2]a. After confirming that the bile duct was correctly punctured on cholangiography, an 0.025-inch guidewire (VisiGlide; Olympus, Tokyo, Japan) was inserted into the biliary tract through the needle. In nondilated bile duct dilatation, a 0.018-inch guidewire (Pathfinder; Boston Scientific Japan, Tokyo, Japan) was used after puncture with a 22G needle (Expect; Olympus Medical Systems, Tokyo, Japan). Tract dilation was performed using a tapered catheter (ERCP catheter; MTW Co, Ltd, Düsseldorf, Germany), a dedicated EUS-BD dilator (ES Dilator; Zeon Medical Co, Tokyo, Japan), and/or a 6-Fr thermal dilator (CystGastroset, Endoflex, Voerde, Germany) [Figure 2]b. Thereafter, the guidewire was advanced through the stricture and the papilla of Vater to the duodenum. If necessary, a hydrophilic guidewire (Radifocus, Terumo, Tokyo, Japan) with the ERCP catheter was used for manipulation [Figure 2]c. After confirming the location and the length of the MBO, an uncovered self-expandable MS (SEMS) (10-mm in diameter; Zilver 635; Cook Medical, Bloomington, IN, USA: 10 mm or 8 mm in diameter; X-Suit NIR; Olympus Medical Systems, Tokyo, Japan: 10 mm in diameter; WallFlex; Boston Scientific Japan, Tokyo, Japan) was antegradely placed across the MBO [Figure 2]d. Finally, a dedicated 8-Fr PS (Type IT, Gadelius Medical K. K., Tokyo, Japan) was placed across the HES route [[Figure 2]e and Video 1]. When re-intervention was needed in cases of prior EUS-HES, EUS-AS+HES was sequentially performed after removal of the previously placed HES PS (Type IT, Gadelius Medical K. K) using a therapeutic duodenoscope (TJF-260V, Olympus). The primary endpoint of this study was the duration of stent patency, including stent dysfunction, patient death, or last follow-up. Secondary endpoints included duration of stent patency in terms of stent dysfunction, technical and clinical successes, overall survival (OS), and procedure-related adverse events. The duration of stent patency was measured from EUS-AS+HES stent deployment until stent dysfunction, patient death, or last follow-up. Stent dysfunction was defined as cholangitis or obstructive jaundice. The duration of stent patency in stent dysfunction was measured from EUS-AS+HES stent deployment to the appearance of stent dysfunction. Technical and clinical successes were defined as successful deployment of the two stents and a 75% reduction in the total bilirubin level or other liver function levels in normal bilirubin level cases before EUS-AS+HES was performed, respectively. OS was measured from the day before EUS-HES in sequential EUS-AS+HES, or simultaneous EUS-AS+HES was done to the time of death or last follow-up. Adverse events were graded according to the American Society for Gastrointestinal Endoscopy lexicon's severity grading system. This study was approved by our Institutional Review Board (No. 3974). The results were presented as median values and means (± standard deviations). 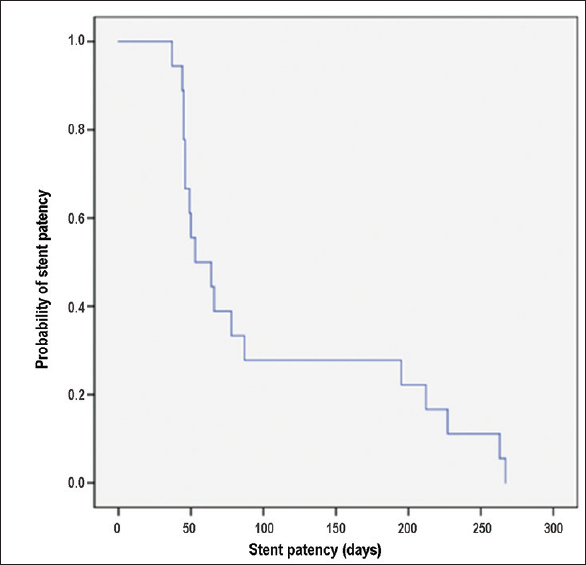 Duration of stent patency was estimated using the Kaplan–Meier method. SPSS version 13.0 (SPSS, Chicago, IL, USA) statistical software was used to carry out all statistical analyses. The characteristics of the patients are shown in [Table 1]. The reasons for MBO were as follows: 11 pancreatic cancers, 2 gastric cancers, 2 ampullary cancers, duodenal cancer, bile duct cancer, and 6 metastatic cancers. Among the patients with metastatic cancer, the primary sites were as follows: 3 renal cell cancers, gallbladder cancer, cervical cancer, and bile duct cancer. Reasons for performing EUS-AS+HES were as follows: 13 gastric outlet obstructions, 7 surgical altered anatomies, and 3 failed ERCPs. The details of EUS-AS+HES are shown in [Table 2]. In total, EUS-AS+HES was carried out in all 23 patients including 5 cases of sequential EUS-AS+HES, in which EUS-AS+HES was carried out when primary HES stent dysfunction occurred. Biliary puncture from the stomach was successful in all patients, with a median size of punctured IHBD, 5 mm (range: 3–9 mm), and the accessed biliary branch duct was B2 in 8 patients and B3 in 15 patients. The fistula was dilated using a dedicated EUS-BD dilator in 12 patients, a thermal catheter in 9 patients, and a standard catheter in 2 patients using the guidewire deployed in the bile duct. After tract dilation, the guidewire manipulation through the MBO and the ampulla were successful in all patients, and an uncovered SEMS 10 mm in diameter and 8 mm in diameter was placed across the MBO in 18 patients and 5 patients, respectively. SEMS placed across the papilla was performed in 16 patients. Finally, technical and clinical success rates were both 100% (23/23). 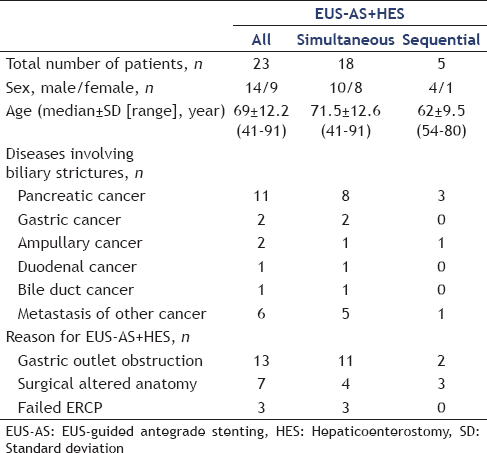 EUS-AS+HES-related adverse events are shown in [Table 2]. There were 2 (8.3%) cases of mild biliary peritonitis only in simultaneous EUS-AS+HES, which were both successfully managed conservatively. The long-term outcome is described in [Table 2]. The OS was 96 days [Figure 3]. 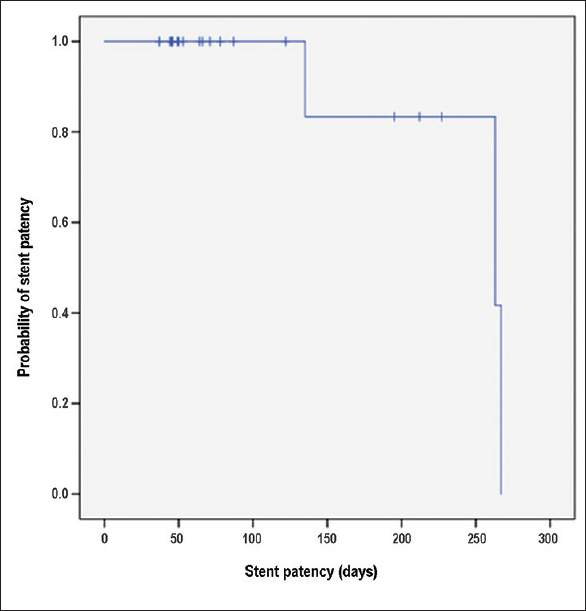 Median duration of stent patency including stent dysfunction, patient death, and period to the last follow-up was 66 days in all EUS-AS+HES [Figure 4], 53 days in simultaneous EUS-AS+HES [Figure 5], and 78 days in sequential EUS-AS+HES [Figure 6]. Stent dysfunction was seen in 3 patients in 267, 263, and 135 days after EUS-AS+HES [Figure 7]. Stent dysfunction included stent obstruction in 2 cases and cholangitis with stent obstruction as a result of sludge in 1 case. Among them, one case underwent best supportive care because of advanced malignant tumor and poor performance status, without re-intervention. In 2 other patients, re-intervention was carried out by balloon cleaning for the EUS-AS stent and stent exchange for EUS-HES. On the other hand, in cases of prior HES, stent dysfunction was seen in all patients in 168, 85, 77, 53, and 27 days after prior HES. 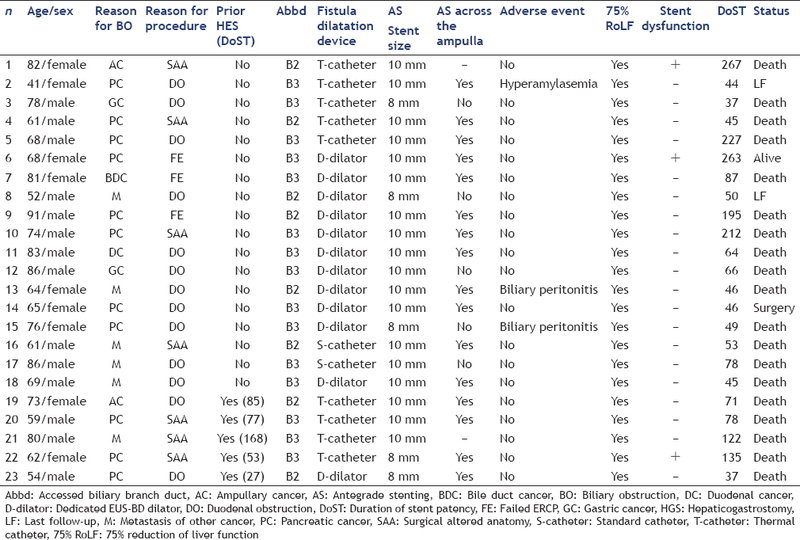 The details of patients and procedure characteristics and outcomes are shown in [Table 3]. Cost analysis for each EUS intervention is demonstrated in [Table 4]. The total cost of EUS-AS+HES using two MSs is greatest. In contrast, those of EUS-HES using PS are lowest. Those of EUS-AS using MS + HES with PS are intermediate between EUS-AS using MS + HES using MS and EUS-HES using PS and are almost the same as EUS-HES using MS or EUS-AS using MS.
EUS-guided choledochoduodenostomy (EUS-CDS) and EUS-HES are common EUS-BD techniques, mostly in patients with malignant diseases at the end stage of disease because these techniques are more simple and do not require difficult guidewire manipulation compared with EUS-AS. However, the primary indication of EUS-BD is thought to be for “failed ERCP." On the other hand, retrograde biliary MS placement by ERCP provides long stent patency, often without stent dysfunction, until the patient's death, compared to PSs, although it is much more expensive. In other words, antegrade MS placement by EUS-AS seems to be theoretically better unless EUS-CDS and/or HES shows superiority such as longer stent patency, apart from technical difficulties compared with EUS-AS, which requires skilled guidewire manipulation, which is limited to failed ERCP cases. In the present study, we demonstrated that EUS-AS using an MS plus HES using a dedicated PS was feasible and could provide a low stent dysfunction rate and anticipate a long stent patency. Moreover, we evaluate EUS-AS+HES because we believe that EUS-AS+HES has three major advantages to EUS-AS alone, as follows: (1) safety using another available drainage route in cases of antegrade stent dysfunction due to acute obstruction and/or tough strictures, (2) easy deployment of the HES stent without any additional needle puncture and guidewire manipulation, and (3) easy re-intervention following stent removal through the HES route in case of antegrade stent dysfunction. In particular, mature HES tract makes it possible to perform simple intervention even in cases of large amounts of ascites at the end stage. On the other hand, however, there are several disadvantages of EUS-AS+HES compared with EUS-AS alone, as follows: (1) Time-consuming though it may not be significant (only a few minutes), (2) cost increase, in particular in cases of MS placement for HES, (3) risk of MS migration during and/or after EUS-HES due to the shortening of the MS, even in high-volume centers of interventional EUS, resulting in fatal adverse events, and (4) possible early stent occlusion due to reflux of residue, in particular in case of large bore MSs. Therefore, we perform dedicated PS, which we reported as a newly designed 8-Fr stent for EUS-HES to overcome those disadvantages, namely cost and stent migration. Although some may think that an 8-Fr diameter is not sufficient for better drainage, the size of the drain in percutaneous transhepatic BD is commonly approximately 8 Fr in diameter. As a result, our previous study demonstrated that the technical and clinical success was 100% and 94.7%, respectively, without any early or late stent migration. The occlusion rate of the present stent was 13.7% during the median follow-up period (5.0 months, range: 0.5–12.5 months). 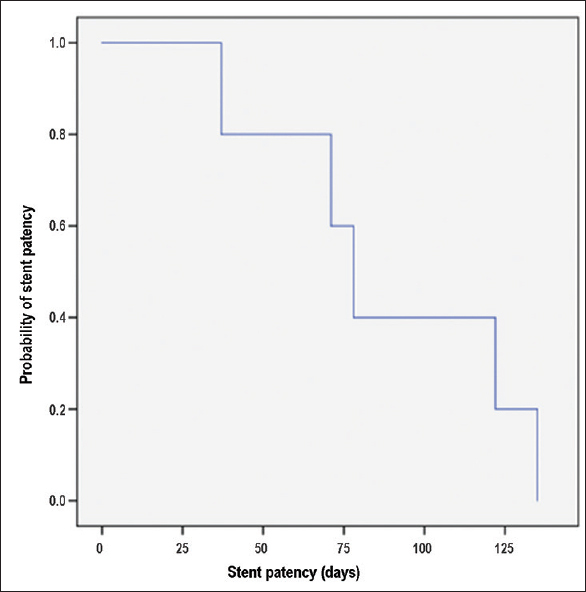 The median duration of stent patency was 4.0 months (range: 0.5–9.0 months). Those data appear to be acceptable for patients with unresectable malignant diseases. Theoretically, a covered MS for EUS-HES has the following potential advantages: (1) it affords better drainage owing to a larger bore stent than a PS; (2) it prevents bile leakage and bile peritonitis; and (3) it prevents bleeding from the tract due to the self-expandable stent. In contrast, current covered MSs may also have several disadvantages as follows: (1) they are more expensive than PSs; (2) popular covered MSs worldwide are all braided-type stents, which show a high shortening rate of more than 40% and have a risk of fatal adverse events such as unexpected stent migration; (3) stent-related occlusion of the left IHBDs is possible; and (4) overdilation of the narrow bile duct is possible. Of these disadvantages, difficulty of stent placement, particularly stent deployment using a braided-type covered MS, is always problematic during EUS-HES. Surprisingly, it has been reported in the literature that there is no obvious difference in the EUS-HES outcome between a PS and a MS. In addition, as for cost analyses, the total cost of EUS-AS using MS + HES using PS is approximately $2000 cheaper than EUS-AS+HES using two MSs, although EUS-hepaticogastrostomy alone using a PS is the cheapest of all procedures [Table 4]. A summary of the medical literature on EUS-AS and EUS-AS+HES using large case series (n ≥ 20) is shown in [Table 5].,, The current data from our unit were superior to data from other literature. Apart from sequential EUS-AS+HES, the success rate (100%) of simultaneous EUS-AS+HES was higher than that in other literature. We assume that the selective hydrophilic guidewire in combination with conventional ERCP catheters and skilled assistants (skilled pancreatobiliary endoscopists) yielded the high success rate of guidewire passage across the stricture and papilla similar to the retrograde fashion of ERCP. Surprisingly, the clinical success rate was also 100% which was the same or better than reported in other literature. In our previous study, since the clinical success rate in EUS-HES alone using a dedicated PS was 94.7%, the present clinical success rate is understandable because of the additional antegrade MS placement. 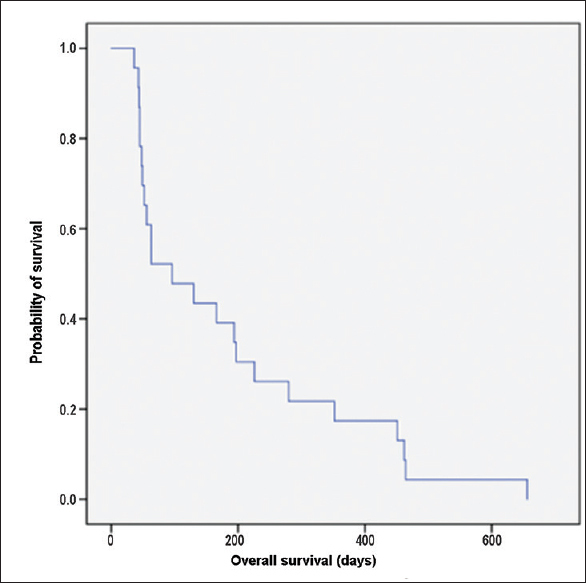 However, the question is why was the clinical success using a dedicated PS for HES better than an MS. We guess that there are the following possible reasons: (1) our antegrade stent was more effective (i.e., it had sufficient expansion and appropriate location of stent placement) compared with stents in other institutions and (2) the effectiveness of rescue HES MSs in other institutions was poor due to stent dysfunction caused by kinking of the stent both in the IHBD and stomach, and there was acute stent obstruction due to the IHBD and liver parenchyma in cases of nondilated bile duct, in particular after decompression of the bile duct. 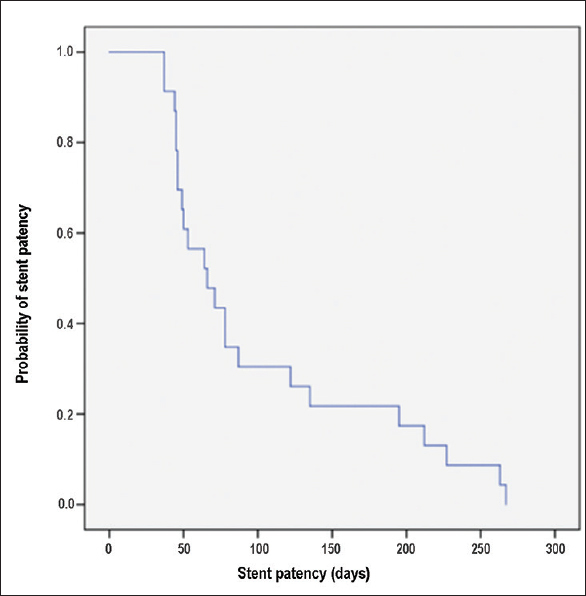 In this current study, we could not perform long-term observation for the stent patency because the duration of stent patency was almost always prescribed by the patient's death. However, EUS-AS+HES has the potential to provide longer stent patency from the results, indicating that the rate of stent dysfunction was low and the time to dysfunction was relatively longer. Interestingly, the procedure-related adverse event rates in EUS-AS+HES were approximately 10% in each institution, which was better than in EUS-AS (20.0%) or EUS-HES (26.1%) even in the same institution. These data suggest that EUS-AS+HES appears to be able to reduce adverse events in comparison with EUS-AS or HES alone. Nevertheless, EUS-AS is still technically challenging. Although we know its outcome seems to be better than EUS-HES, conventional EUS-HES alone is acceptable in cases of inability of guidewire passage across the stricture and papilla, in particular by nonexperts of EUS-BD. Then, when HES stent occlusion occurs, ERCP-guided antegrade stenting can be safely performed through the matured tract. Our results demonstrated that sequential antegrade stenting appears to be one option when prior HES stent occlusion occurs, though further cases should be accumulated for evaluation in the future. The limitations of this study were its retrospective nature, the lack of a control group, and the limitation to a single-center experience. The novel EUS-BD technique, EUS-AS using an MS plus HES using a dedicated PS was a feasible procedure for MBO and yielded longer duration of stent patency. Furthermore, sequential antegrade stenting in cases of occluded HES seems to be another option instead of HES stent exchange. Further large-scale comparison studies with EUS-HES, EUS-AS, and EUS-AS+HES are required to confirm its clinical efficacy. The authors are grateful to Professor J. Patrick Barron of Tokyo Medical University for his editing of the manuscript. Takao Itoi is a consultant of Gadelius Medical K. K and no others have any conflict of interest. Mukai S, Itoi T, Baron TH, et al. Indications and techniques of biliary drainage for acute cholangitis in updated Tokyo guidelines 2018. J Hepatobiliary Pancreat Sci 2017;24:537-49. Umeda J, Itoi T. Current status of preoperative biliary drainage. J Gastroenterol 2015;50:940-54. Ishii K, Itoi T, Tonozuka R, et al. Balloon enteroscopy-assisted ERCP in patients with roux-en-Y gastrectomy and intact papillae (with videos). Gastrointest Endosc 2016;83:377-86.e6. Tsuchiya T, Sofuni A, Tsuji S, et al. Endoscopic management of acute cholangitis according to the TG13. Dig Endosc 2017;29 Suppl 2:94-9. Kahaleh M, Hernandez AJ, Tokar J, et al. 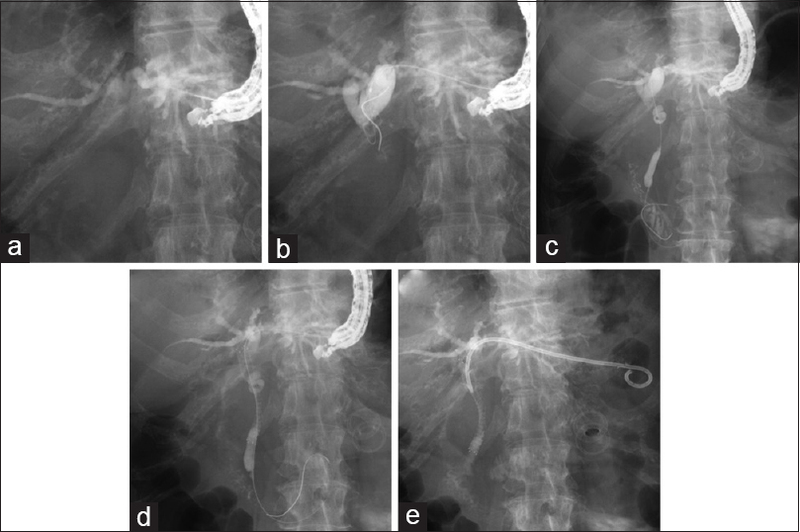 Interventional EUS-guided cholangiography: Evaluation of a technique in evolution. Gastrointest Endosc 2006;64:52-9. Artifon EL, Safatle-Ribeiro AV, Ferreira FC, et al. EUS-guided antegrade transhepatic placement of a self-expandable metal stent in hepatico-jejunal anastomosis. JOP 2011;12:610-3. Khashab MA, Valeshabad AK, Afghani E, et al. Acomparative evaluation of EUS-guided biliary drainage and percutaneous drainage in patients with distal malignant biliary obstruction and failed ERCP. Dig Dis Sci 2015;60:557-65. Itoi T, Dhir V, Moon JH. 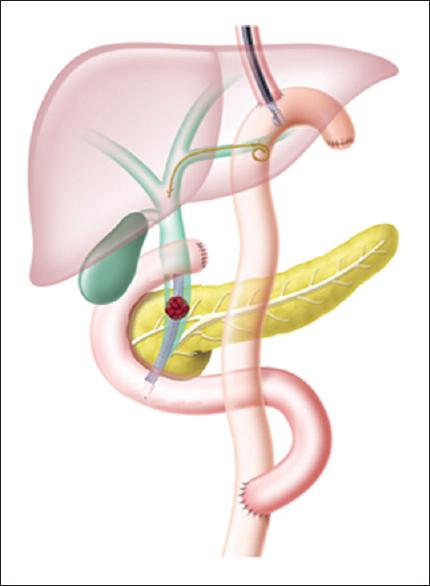 EUS-guided biliary drainage: Moving into a new era of biliary drainage. Gastrointest Endosc 2017;85:915-7. Khashab MA, Bukhari M, Baron TH, et al. International multicenter comparative trial of endoscopic ultrasonography-guided gastroenterostomy versus surgical gastrojejunostomy for the treatment of malignant gastric outlet obstruction. Endosc Int Open 2017;5:E275-81. Mukai S, Itoi T. How should we use endoscopic ultrasonography-guided biliary drainage techniques separately? Endosc Ultrasound 2016;5:65-8. Ogura T, Edogawa S, Imoto A, et al. EUS-guided hepaticojejunostomy combined with antegrade stent placement. Gastrointest Endosc 2015;81:462-3. Kumbhari V, Tieu AH, Khashab MA. EUS-guided biliary drainage made safer by a combination of hepaticogastrostomy and antegrade transpapillary stenting. Gastrointest Endosc 2015;81:1015-6. Umeda J, Itoi T, Tsuchiya T, et al. Anewly designed plastic stent for EUS-guided hepaticogastrostomy: A prospective preliminary feasibility study (with videos). Gastrointest Endosc 2015;82:390-6.e6. Honjo M, Itoi T, Tsuchiya T, et al. Safety and efficacy of ultra-tapered mechanical dilator for EUS-guided hapaticogastrostomy and pancreatic duct drainage compared with electrocautery dilator (with videos). Endosc Ultrasound 2018. doi: 10.4103/eus.eus_2_18. [Epub ahead of print]. Cotton PB, Eisen GM, Aabakken L, et al. Alexicon for endoscopic adverse events: Report of an ASGE workshop. Gastrointest Endosc 2010;71:446-54. Holt BA, Hawes R, Hasan M, et al. Biliary drainage: Role of EUS guidance. Gastrointest Endosc 2016;83:160-5. Tonozuka R, Itoi T, Tsuchiya T, et al. EUS-guided biliary drainage is infrequently used even in high-volume centers of interventional EUS. Gastrointest Endosc 2016;84:206-7. Okuno N, Hara K, Mizuno N, et al. Stent migration into the peritoneal cavity following endoscopic ultrasound-guided hepaticogastrostomy. Endoscopy 2015;47 Suppl 1 UCTN: E311. Martins FP, Rossini LG, Ferrari AP. Migration of a covered metallic stent following endoscopic ultrasound-guided hepaticogastrostomy: Fatal complication. Endoscopy 2010;42 Suppl 2:E126-7. Iwashita T, Yasuda I, Mukai T, et al. Endoscopic ultrasound-guided antegrade biliary stenting for unresectable malignant biliary obstruction in patients with surgically altered anatomy: Single-center prospective pilot study. Dig Endosc 2017;29:362-8. Ogura T, Kitano M, Takenaka M, et al. Multicenter prospective evaluation study of endoscopic ultrasound-guided hepaticogastrostomy combined with antegrade stenting (with video). Dig Endosc 2018;30:252-9. Imai H, Takenaka M, Omoto S, et al. Utility of endoscopic ultrasound-guided hepaticogastrostomy with antegrade stenting for malignant biliary obstruction after failed endoscopic retrograde cholangiopancreatography. Oncology 2017;93 Suppl 1:69-75.